Purchase a denture repair kit from a drug store, pharmacy or retail store (Walgreens, CVS or Walmart). Most denture repair kits come with upper and lower replacement teeth, a bonding adhesive, a eye dropper for applying the adhesive and other supplies for helping you repair your denture or partial denture. The bonding adhesive is completely safe to use and dries quickly. The kit also comes with directions on how to apply the adhesive to the broken tooth and how to fit the tooth or a replacement tooth on to your current denture. 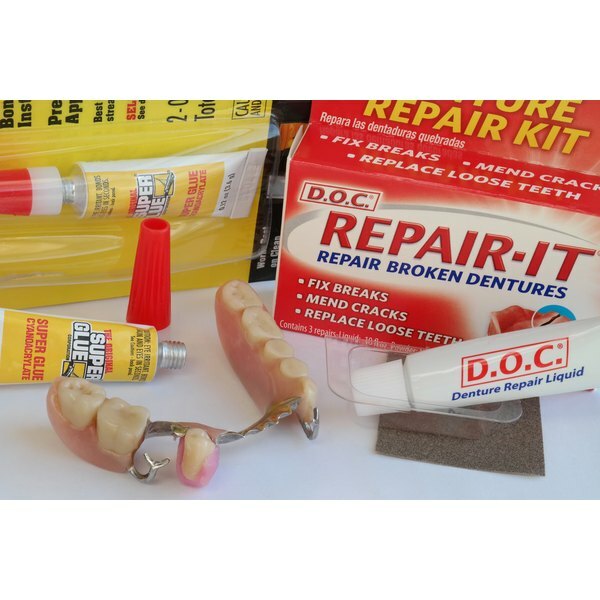 Denture repair kits range in price from $6.29 (kit comes with bonding adhesive only--no replacement teeth) to $19.99 (kit comes with replacement teeth and bonding adhesive) and brand names include D.O.C. Emergency Denture Repair Kit and Plate Weld Temporary Emergency Denture Repair Kit. Other adhesives like “Krazy Glue” should only be used to temporarily repair a tooth on a denture or partial denture when a denture repair kit can not be purchased. Krazy Glue and other adhesives could cause toxins to enter your blood stream and can also cause unusual allergic reactions. Use caution when using these adhesives and see your dentist as soon as you can to properly replace the broken or damage denture or partial.